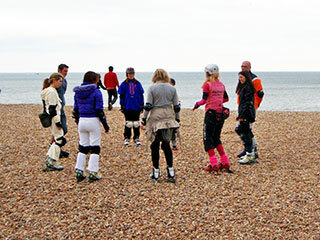 Once a month, during the skating season (usually April to November), Skatefresh holds group classes in Brighton for children and adults: Kids Club, Beginner, Improver, Intermediate and Advanced levels. To book please fill in the form below. 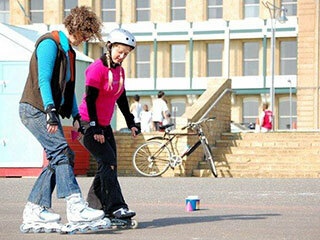 All classes are held at Hove Lawns skating area, past the Lawns Café in front of the painted beach huts. Places are limited so please book in advance by completing the booking form at the bottom of this page telling us your name and phone number and the class and date you would like to attend. Private lessons in Brighton with Asha can be arranged when she is free. To arrange a private lesson please complete the booking form below with your contact details and when you would like your lesson.  Minimum protective gear must be worn (knee and wrist pads – helmets for kids). 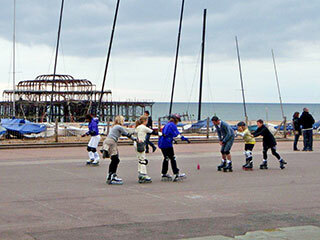 All private clients meet to the left of the Pier on Brighton sea front. 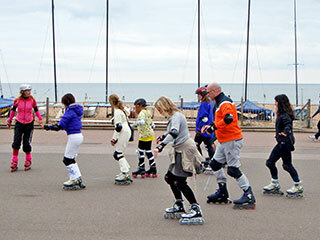 These group classes are suitable for kids aged 6-11 who can already skate a bit on their own. 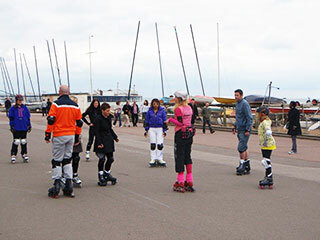 Using games and rolling activities we will guide your child through the basic skills of inline skating, ensuring they have lots of fun and plenty of movement. We will focus on skate safety, stopping methods, and giving them a variety of exercises to support their learning. If your child is a complete beginner there will be a half-hour preparatory class to teach the basics starting at 12pm and costing £15 for one child. If more children need this introduction the cost can be shared. All children must bring skates (inlines please) to the lesson and also protective wrist and knee guards and a helmet (cycle helmet is fine). Without safety kit they will not be allowed to join the class. Plastic skates are not recommended. A maximum of 10 children in the group, so please book early to avoid disappointment. Start at the very beginning with safety stuff, gentle stride and of course stopping (using your heel brake or toe stops). 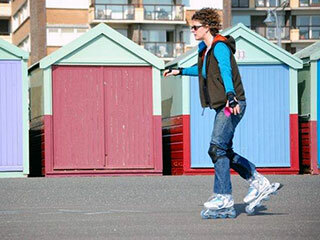 Start at Improver level if you have taught yourself to skate (on either inlines or quads) and can get around on your wheels but your heel brake stopping isn’t working well and you don’t feel secure on slopes or in emergency situations. Or you’ve completed our Beginner class and want to take things to the next level. The focus point of Improver is to increase your confidence by learning (and mastering) to stop correctly. 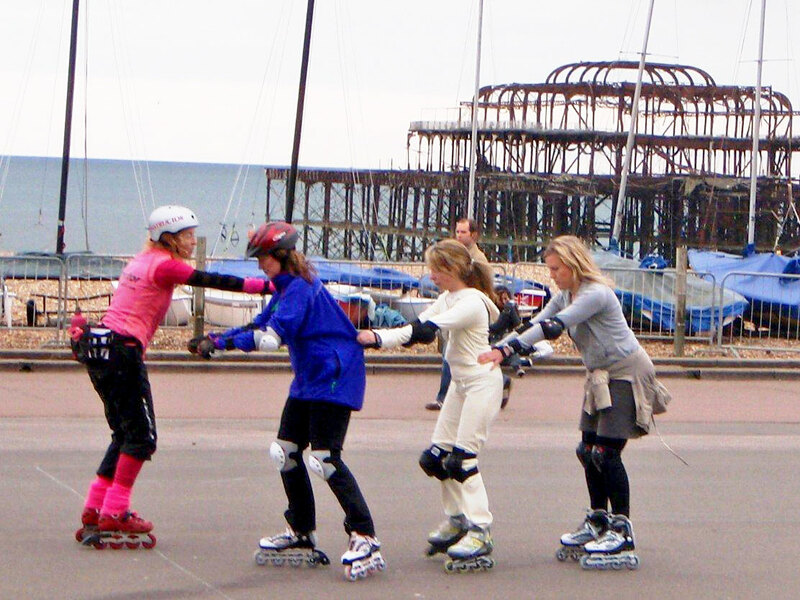 Intermediate level is for skaters wanting to learn new stops, backwards skating and confident turns. We will also look at improving your stride, speed and crossovers. Polish your backwards skating and hone your transitions, jumps, spins, back crossovers, three turns and other requested moves. Let us know what you’d like to cover. 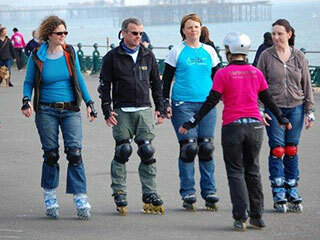 If you are a LocoSkates customer and have purchased a pair of inline skates you are entitled to £10 discount on a beginner group lesson or one free Kids Club session. Please state ‘LocoSkates Lesson’ when booking. Please enter the agreed price for your lesson(s) in the price box below, click Book Now, then Checkout. Please DO NOT PAY until you have received email confirmation from Trish.